The badge holder demonstrates the ability to manage and coordinate global integrated services delivery teams to provide services to clients. Collaborates across the account team to provide a seamless delivery experience to their client. Ensured quality delivery of services to an IBM client by successfully providing leadership and ownership of their services domain. Achieved integration with all other teams providing services to the client so that the client receives seamless service delivery. Successfully managed costs for their service domain and interlocked with account leadership to meet the financial objectives of the account. Demonstrated leadership, client management and team building skills as they pertain to the client contracts they support. 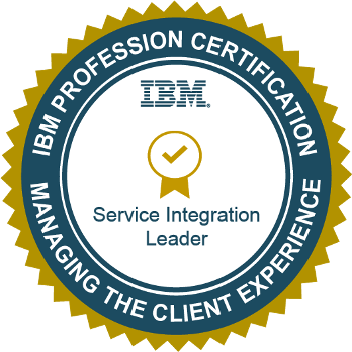 Successfully defined and managed the governance of an IBM client account as it pertained to their service domain including communications planning, escalation management systems and organizational linkages. Demonstrated and led with a client first methodology, always working to deliver superior services to their client. The Additional Information link below is accessible by IBM employees only.